Royal Doulton is a quintessentially English name in tableware, fine gifts and collectables with a pedigree dating back to 1815. 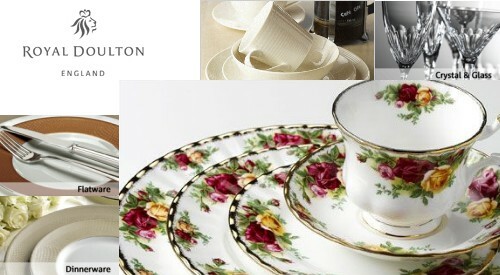 Royal Doulton is part of WWRD Holdings Limited, the leading provider of luxury home and lifestyle products worldwide, sold under a number of well-recognized brands, including Waterford, Wedgwood, Royal Doulton, Royal Albert, Minton and Johnson Brothers. WWRD Holdings Limited maintains unique licensing arrangements with some of the most high-profile innovators in the home and lifestyle market, including Vera Wang, Jasper Conran, John Rocha, Monique Lhuillier, Barbara Barry, Gordon Ramsay, Martha Stewart and Michael Aram.